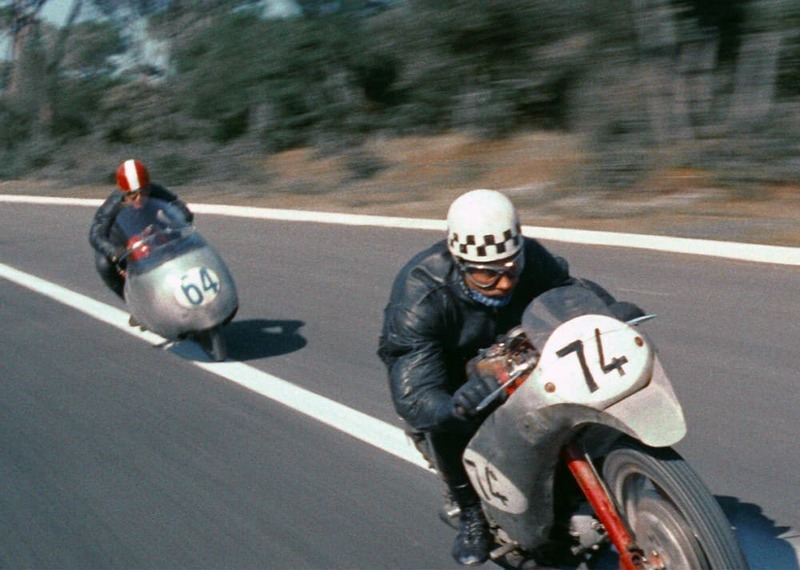 “I fidanzati della morte” is a movie shot in the motorcycle racing world by Romolo Marcellini, famous for his Oscar nomineé 1960 documentary “The Great Olympics”. The film has been forgotten for nearly 60 years. After its first release in 1957 it literally vanished without leaving a trace, except from some books and articles reminding of it as the “first great motorcycling movie”. 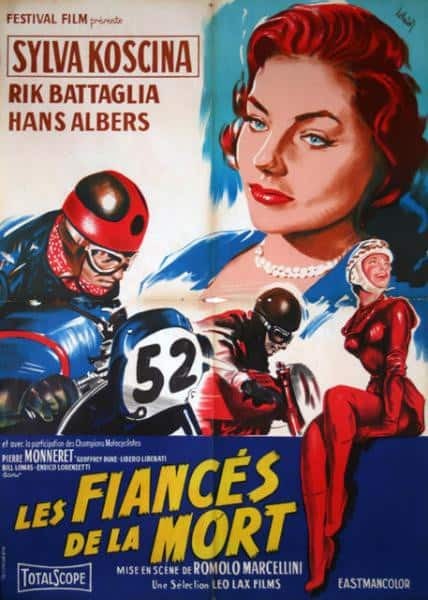 “I fidanzati della morte” is a tale of love, rivalry and passion set in the 50s madcap world of motorcycle speed races, shot on the occasion of the main competitions of that time, such as the real Monza’s MotoGp and the last edition of the legendary Milano-Taranto road race. It also features some very rare footage of the Moto Guzzi wind tunnel and factories in operation. Furthermore, in the movie it is possibile to enjoy images of the Italian 50s wall of death, of motocross competitions and of crazy sidecar races on dirt tracks. Most of all, the movie features, alongside popular actors Rik Battaglia and Sylva Koscina, many of the most important champions of those years: Geoffrey Duke, Libero Liberati, Bill Lomas, Enrico Lorenzetti, Reg Armstrong, Stanley Woods, Ken Cavanagh, Dickie Dale, Thomas Campbell, Pierre Monneret, Albino Milani, Walter Zeller, Bruno Francisci, all of them riding amazing Moto Guzzi, Gilera, Mondial and Norton bikes with the so captivating and dangerous dustbin fairings that ended up being banned in 1958. It’s as if nowadays a director shot a feature narrative film, starring Marc Marquez, Jorge Lorenzo, Valentino Rossi, Daniel Pedrosa and Andrea Dovizioso as background actors! 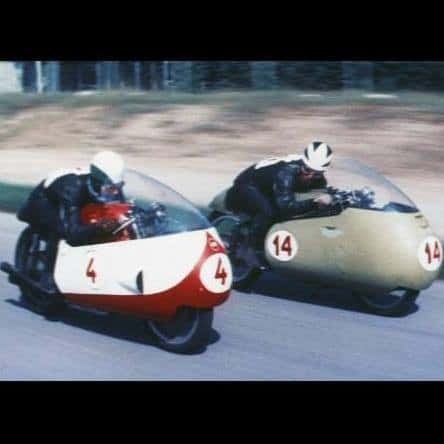 “I fidanzati della morte” is able to bring the audience back to the real atmosphere and colors of motorcycle racing, motors engineering, looks and fashion of the 50s, when Moto Guzzi and Gilera ruled the MotoGp with their so uniquely creative and performing machines. A movie like no other in its genre, recovered and now restored for the first time by Rodaggio Film, an italian film distribution company working with motorcycle themed movies, thanks to a successful crowdfunding campaign with thousands of supporters from 22 countries and the precious help of authoritative testimonials such as the 15 times world champion Giacomo Agostini, Paul d’Orleans aka The Vintagent, the french artist Lorenzo Eroticolor (who created the art for the new poster and DVD cover), the writer and Moto Guzzi lover Melissa Holbrook Pierson and many others. “I fidanzati della morte” bears unique witness to the international motorcycling’s golden age and to an exceptional season of Italian excellence, innovations and challenges in the thrilling world of two wheels. The project took almost three years to be completed. The restoration process was based on a positive copy coming from the main Italian film archive, the Cineteca Nazionale. After some time the precious original negative, once thought lost in a fire, was found in a laboratory in Rome. Unluckily the film material was partially burned, but most of it was in good condition and has been used as the main reference for the restoration process. The film has been first physically repaired and digitally scanned, then cleaned frame by frame and color corrected. The sound has been digitally restored and improved as well. All the restoration work was carried out by the world famous Immagine Ritrovata Laboratory, in Bologna, Italy. The movie is now available for festivals, public screenings in cinemas, motorcycle events, and for purchase on VOD and on DVD, coming in a precious case along with a book containing articles about the 50s motorcycle racing world, by some of the most prominent Italian motorcycle journalists. The DVD also features some extra contents such as rare footage, found among discarded film materials, from the now lost English version (titled “Tornado on Wheels”!) and the testimonial videos and interviews to Giacomo Agostini, the 9 times world champion Carlo Ubbiali, Paul d’Orleans, Melissa Holbrook Pierson, Livio Lodi, curator of the Ducati Museum, Paolo Sormani and the world famous moto customizer Roberto Totti. This entry was posted in Blog and tagged brat, cafe racer, custom, DVD, engaged to death, films to watch' vintage motorcycles, iotalian road racer, Moto gp, movie, road race, tracker, tt.